That's the cover of the paperback tie-in edition of Stephen King's IT that was released in 1990 when the mini-series first aired on ABC. It's the edition that I bought and read when I was in fourth grade. I don't know if that explains why I'm fucked up, or if I loved it because I'm fucked up. Chicken or the egg. Three years ago, Warner Bros. bought the rights to adapt the book into a theatrical film. According to the Hollywood Reporter, the project is now underway with Cary Fukunaga set to direct. What's more, they've gotten the green light to adapt it as two separate films, freeing it from the both the time and content restrictions that handicapped the TV version. 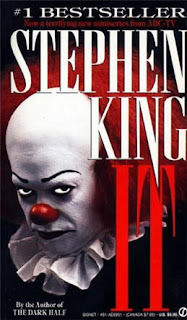 Also (and I can't be the first to notice this), isn't it just perfect that Pennywise is being brought back to life twenty-seven years after the events in the book? Earlier this year I posted an open letter to screenwriter David Kajganich about some of the changes he was reportedly making to the script. I also posted it to his IMDB page and the forum on Stephen King's official website, hoping that by some chance it might be brought to his attention. While checking the forum last night, I was very pleasantly surprised to find that he had indeed read it and left a personal response. Lilja over at Lilja's Library alerted me to your post a couple of weeks ago, but I couldn't respond right away; I knew this news about Cary Fukunaga coming on board to direct IT was about to be announced any day, and I didn't want to be disingenuous with you. Now that the news is out, I can properly thank you for your impassioned plea to keep the adaptation set in the decades King intended. I happen to agree with you 100%, but as often happens with these kinds of decisions, the studio's preference became the screenwriter's mandate. But now that WB has finally opened the door to splitting IT into two films (something for which we lobbied unsuccessfully), perhaps they are also open to returning the story to its original time span. Regardless, this news about Cary Fukunaga is a cineast's dream come true. I honestly went berserk with excitement when I heard. I'm truly sad not to be able to continue working on IT, but I'm so happy the project is alive and well, and in such incredible hands with Cary and Chase Palmer. They are going to give us a vision of IT that I really think is going to knock us all on our asses. Hooray for Hollywood, which sometimes gets it so, so right. That's really cool that he wrote back to you! Makes me want to contact more people who I admire on their websites. Yeah, I'd rather see them do a legitimately good version of IT and THE STAND than DARK TOWER for a lot of reasons. I know what you mean. Personally, I'm kinda glad that they handed this over to a non-genre director. This way it has more of a chance to bring something fresh and interesting to the genre than it would with someone who just wants to make the next horror flick. As for the Dark Tower, I'll watch it when and if it happens, but those last two books were so soul-crushingly disappointing that I just can't get psyched about it anymore. I read somewhere that David left the Pet Sematary remake as well because the studio wanted it dumbed-down. Too bad because he seems to have a lot of integrity. Really? If that's true, it's a shame. Like you said, he seems like a pretty stand-up guy, and as fans, we always love to see the films in the hands of people who are passionate about the source material. But to tell you the truth, Pet Sematary is one of the few King adaptations that I think was perfect the first time around. Jud, Lewis, Gage, Zelda, all of them looked exactly the way I'd pictured them when I read the book (Zelda a little TOO much so).